Where can studying Art or Design take you? What kinds of careers exist for those who study creative subjects. Total Creative Economy employment across the UK has increased from 2.4 million in 2011, to 2.6 million jobs in 2013, an 8.8 per cent increase. There were 1.71 million jobs in the Creative industries in 2013, an increase of 10.1 per cent since 2011. In 2013 there were 1.80 million jobs for people in Creative Occupations, a 7.3 per cent increase since 2011. These increases compare with a 2.4 per cent increase in the total number of jobs in the wider UK economy over the same period. The proportion of Creative Economy jobs varies by region and devolved administration. In 2013, across the whole of the UK, around 1 in 12 jobs (8.5%) were in the Creative Economy and ranged from 1 in 20 jobs (5.1%) in the North East to 1 in 6 jobs (16.2%) in London. The Creative Industries accounted for 1 in 18 jobs, (5.6%) of all jobs in the UK in 2013, and ranged from 1 in 32 jobs (3.1%) in Northern Ireland to 1 in 9 jobs (11.4%) in London. Almost a third (30.3%) of Creative Industries jobs were based in London. Between 2011 and 2013, within the Creative Industries, there were increases in jobs of greater than 20 per cent in: the East of England (27.1%); the East Midlands (25.0%); the West Midlands (20.6%); and Yorkshire and The Humber (20.1%). More than half (57.7%) of jobs in the Creative Economy were filled by people who have a degree or higher qualification in 2013 compared to 31.1 per cent of all jobs in the UK. One in every six jobs held by graduates in the UK was in the Creative Economy. 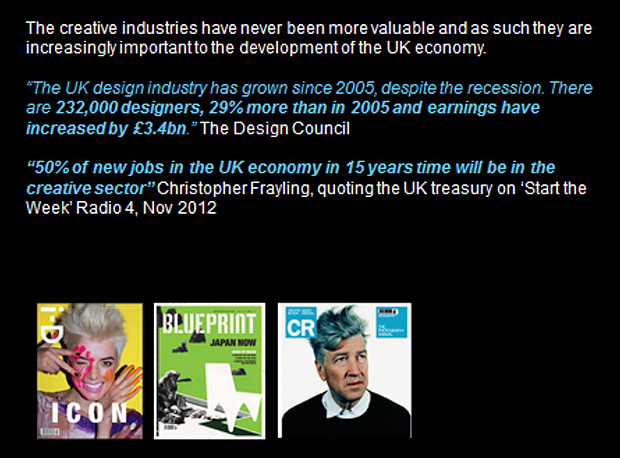 One in every ten jobs held by graduates in the UK was in the Creative Industries. Between 2011 and 2013, there was an increase of 188,000 degree-level jobs in the Creative Economy to 1.5m. The picture for the Creative Industries is similar to that of the Creative Economy, with the majority of jobs filled by people with at least a degree (58.5% in 2013). Of the 1.71 million jobs in the Creative Industries, almost 1 million were filled by people whose highest qualification was a degree. There were 1.8rn jobs in Creative Occupations across all industries, in 2013 and had a higher proportion of degree level workers (61.1%) than across the wider Creative Economy (57.7%). 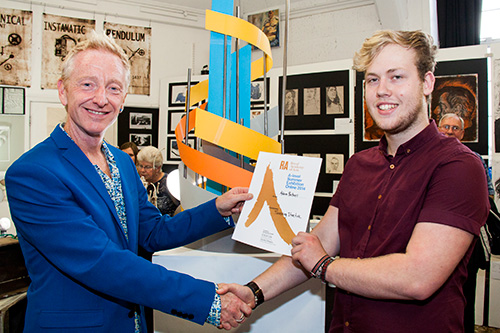 Pictured above - Paul Penketh, Head of Visual Arts at BHASVIC presenting the Royal Academy of Arts certificate to Adam Britnell during the Creative Arts Festival. 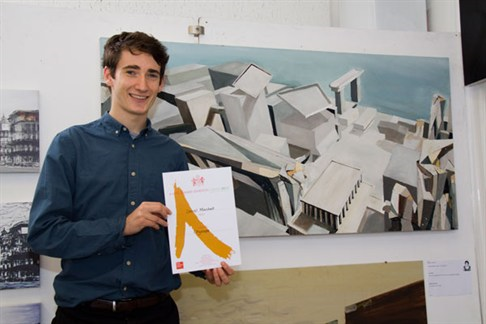 Two works of art by BHASVIC Visual Arts student Adam Britnell were selected by the Royal Academy of Arts for their on-line exhibition. Out of 1,280 entries, 36 students have been selected for their outstanding work. "Much of the work ethic that has got me through Cambridge was learnt in BHASVIC, and I owe part of the past three years success in Cambridge to the culture I found between 2009 – 2011. 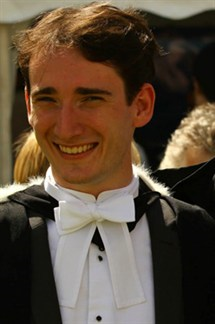 I treasure the two years in the art department – you helped me to explore a set of skills which become critical to my degree, and I am very grateful for your enthusiasm and encouragement over a very enjoyable year!I graduated from the Peterhouse college with a starred first this summer (81% average). A starred first is a special degree that is awarded by Cambridge for people who do better than just a first - so it is a pretty good result! I managed to maintain three years as top-of–tripos!, and won various awards from the department for best all round student which is rather exciting!"